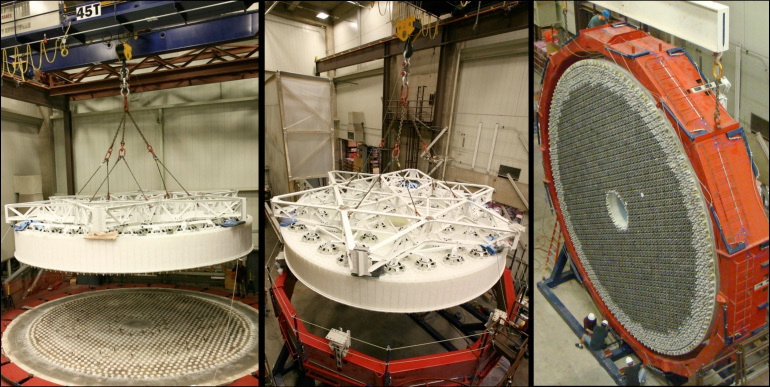 The LSST secondary mirror (M2) system has completed another big milestone, with successful demonstration of closed-loop mirror control. 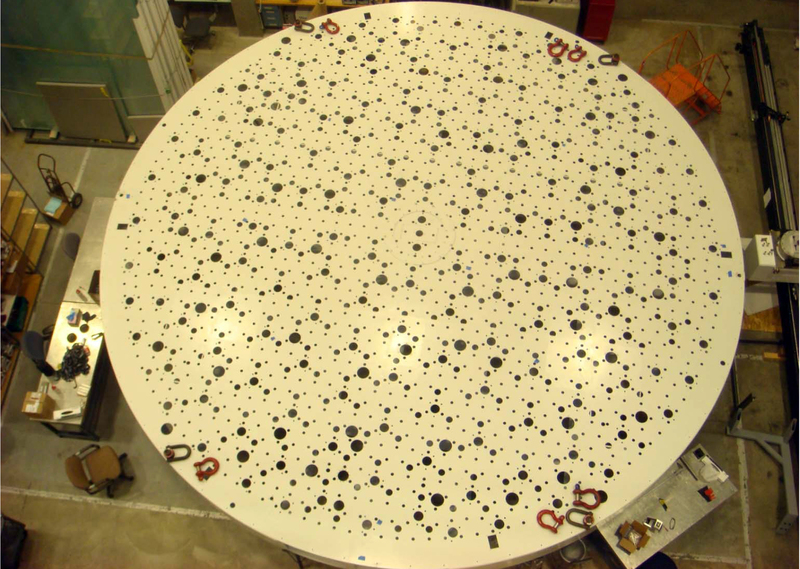 The Harris team accomplished this using the aluminum surrogate mirror integrated into the cell assembly. Meanwhile, the mirror substrate is being prepared for its “first light optical test” in July at Harris in Rochester, NY, with the successful bonding of all actuator pads. The primary/tertiary mirrors shown in place with the secondary mirror and camera shown from the side and from above. 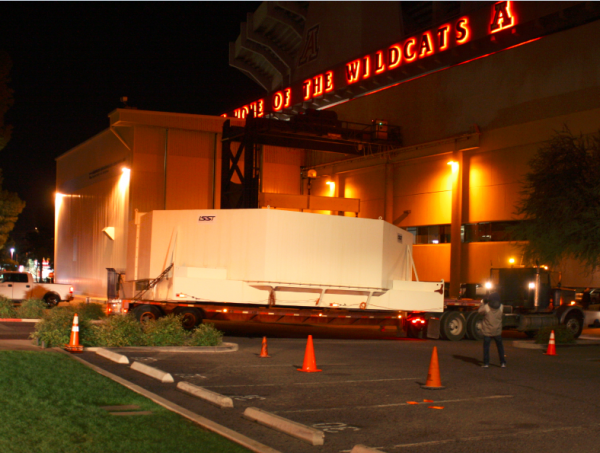 The bottom covers of the box are removed so technicians can attached the mirror's hard points, the gold-tone fixtures under the mirror, to the blue supporting fixtures of the box. The mirror is lifted from its polishing cell (the big round device with protruding tubes) onto the bottom section of its box (the square device). 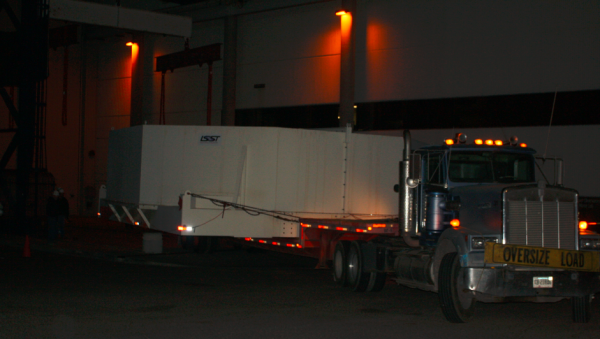 The mirror rests in its container with the lifter on its stand in the back. 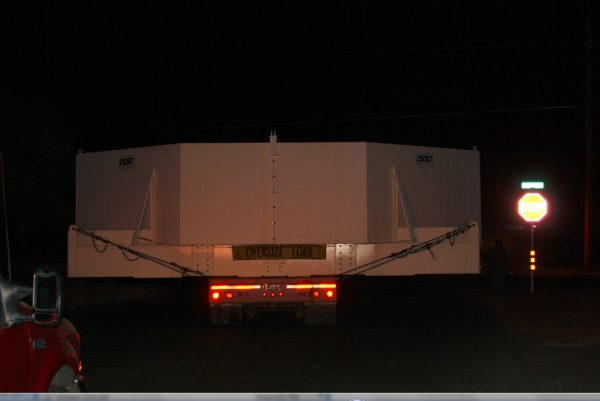 The lifter pauses above the mirror after installation of the mirror in the container. 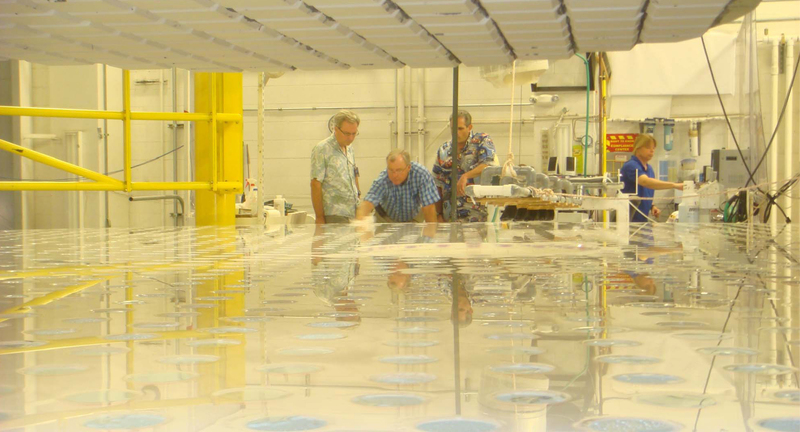 The mirror is lifted from the polishing cell (in the far back) to the container (in the front). A close-up of one of the vacuum pads after it has been secured to the mirror. The pumps were turned off and the pressure was monitored overnight and checked the following morning to ensure that there were no leaks before lifting the mirror into its container. The lifter is supported by the crane above the mirror with 54 vacuum pads on the mirror. 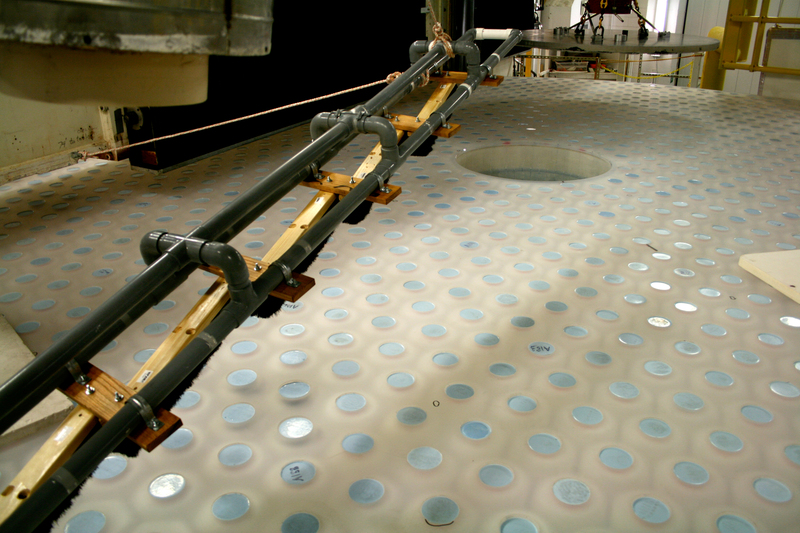 The pumps connected to the pads (yellow boxes located on the lifter) are on in this picture, creating a vacuum under each pad and securing the mirror to the lifter. 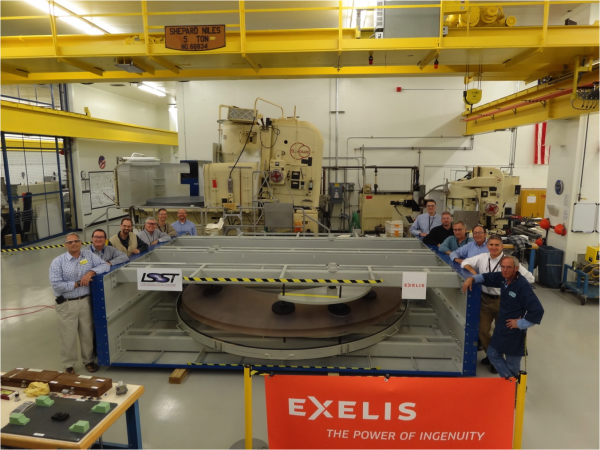 LSST Telescope and Site Project Manager William Gressler and Exelis personnel pose with the LSST secondary mirror (M2) substrate in the vendor's receiving area. 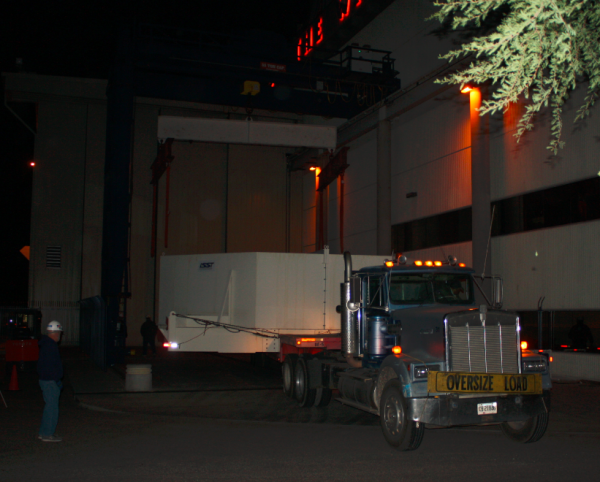 The 72,620 pound M1M3 shipping container was successfully transported from CAID Industries in Tucson to the UofA Mirror Lab. 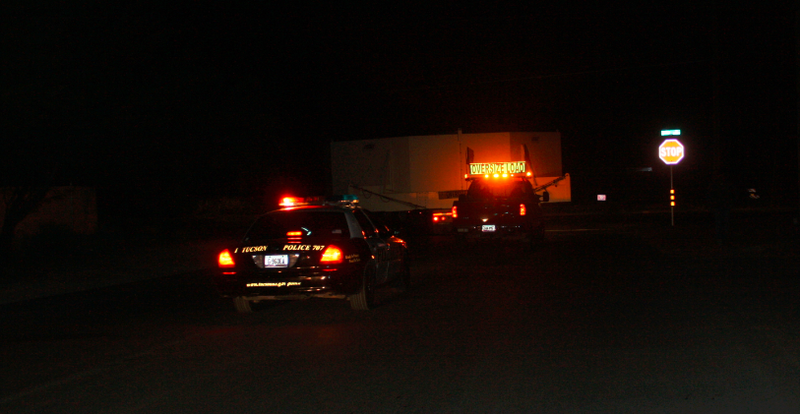 The 30ft x 30ft oversize load departed at 4am, escorted by four Tucson police cars and two pilot vehicles. Offloading was completed by 5:30am. Once Final Acceptance Testing is completed, the M1M3 will be stored locally in Tucson for final integrated testing prior to shipment to the summit facility in Chile. 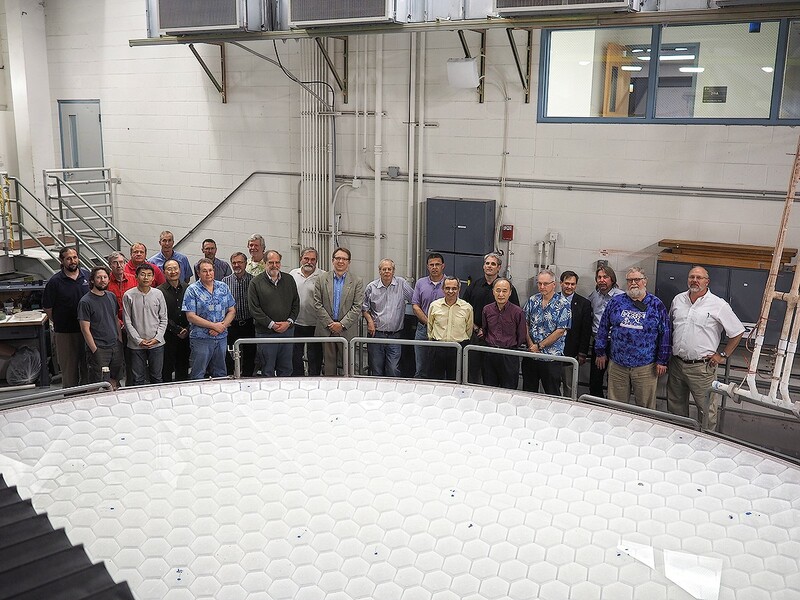 The unique LSST M1/M3 mirror surfaces are nearing perfection. Both mirror surfaces are being carefully polished and optically tested with completion anticipated by the end of December 2013. M1/M3 - It's Two Mirrors in One! 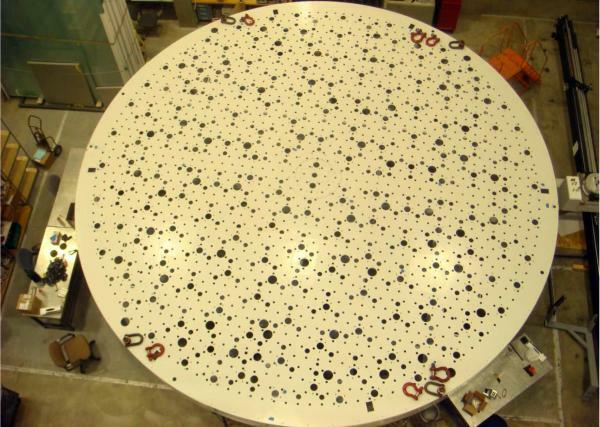 Clearly visible in this mid-June 2012 photograph are the dual optical surfaces in the LSST M1/M3 mirror blank. 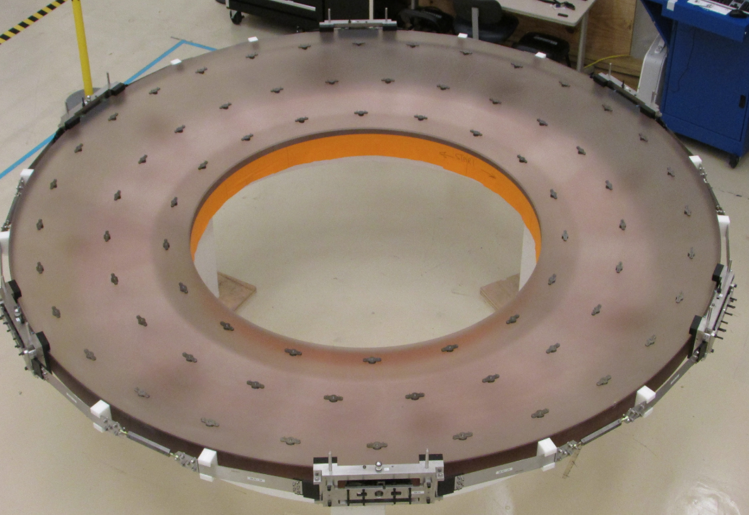 The steeper 5.0-meter diameter M3 surface, with its short radius of curvature, descends toward the center while the outer 8.4-meter diameter M1 surface sweeps outward to the edge of the substrate. 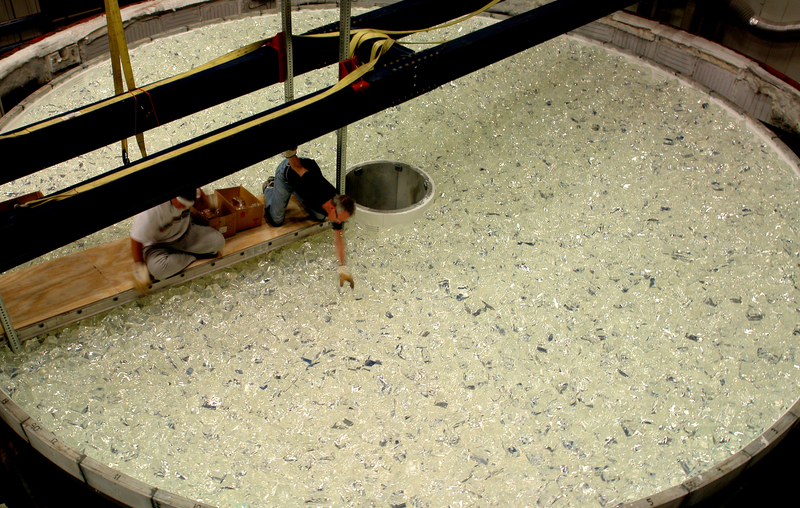 Generation of both the M1 and M3 figure is now completed, with nearly 5 tons of glass removed to achieve the required approximate shape before polishing can begin. Laser tracker measurements confirm that the primary and tertiary surfaces are located properly with respect to each other. Next polishing actuators and thermocouples will be installed on the polishing cell for precision polishing of the front surface. 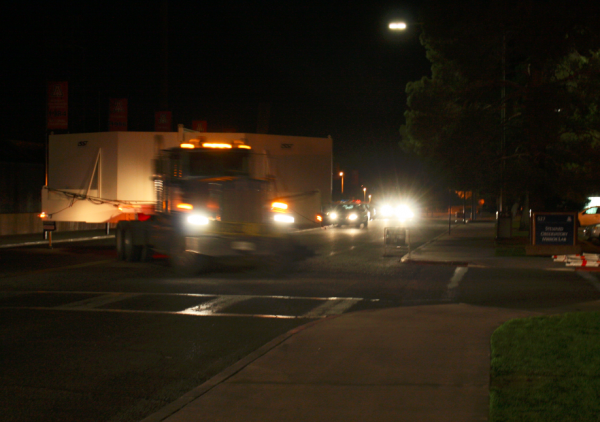 The M1/M3 dual surfaces are scheduled to be complete in January 2012. 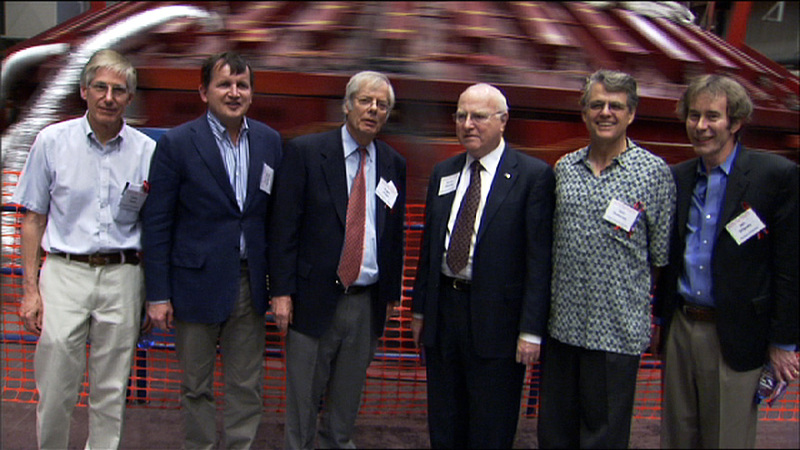 Shown L-R: S. Jacoby, C. Claver, S. Wolff, V. Krabbendam, J. Schaefer. The LSST M1M3 mirror is face down on the SOML large optical grinder and the back surface core holes have been plugged (blue circles) in preparation for grinding and polishing the back surface of the mirror. 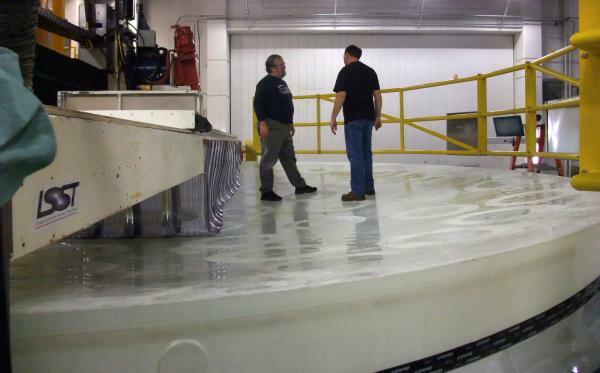 Doug Neill, Steve Warner, and Bill Gressler (L-R) inspect the back surface of the LSST M1M3 blank after the 40 micron loose abrasive grinding process. 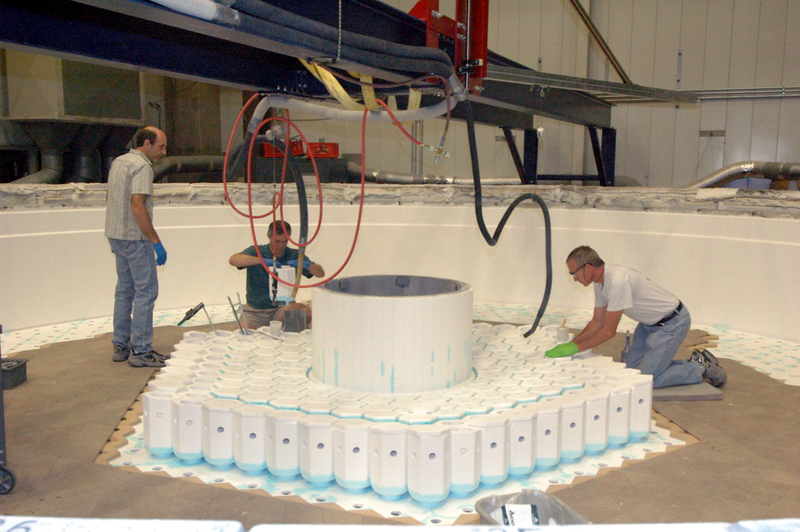 Above in the foreground is the large loose abrasive grinding lap used to process the back surface. 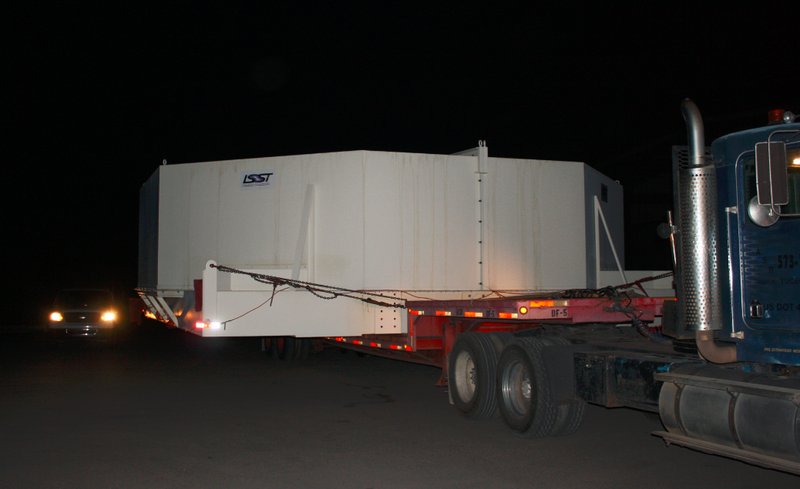 The steel polishing cell to support the M1M3 mirror blank during the upcoming front surface optical processing is delivered to SOML in the Integration Lab. 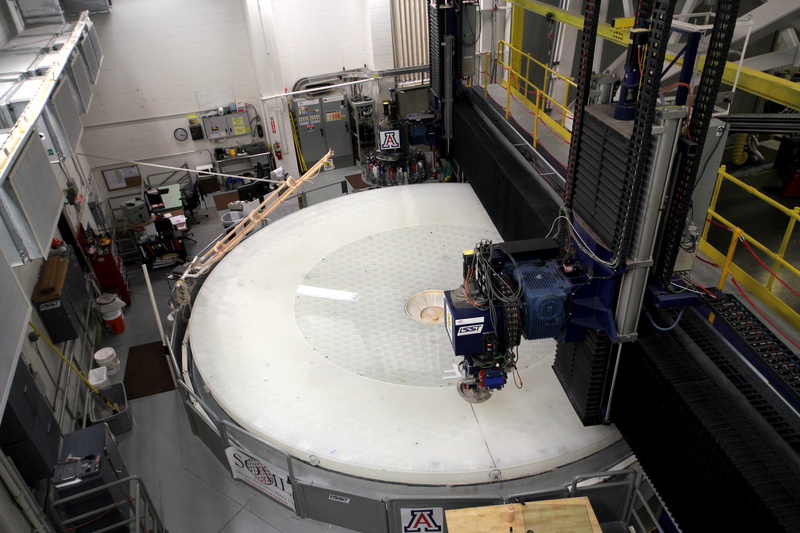 The 8.4-meter LSST mirror blank has been successfully lifted from the furnace hearth at the Steward Observatory Mirror Lab, installed into a turning ring, and tilted to a vertical position. 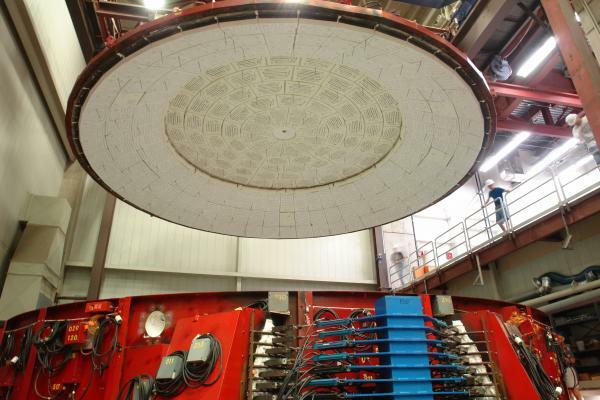 It is now ready for core cleanout, which will reduce its mass from 46,500 kg to 16,600 kg. The mirror is scheduled to be completed in January 2012, and will be the largest two-surface optical mirror ever made from a single substrate. 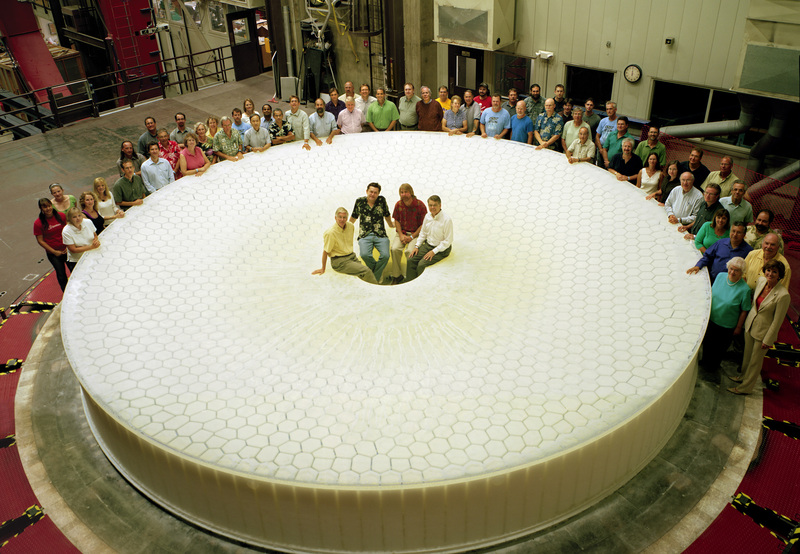 Members of the team building the LSST, a large survey telescope being built in Northern Chile, gather to celebrate the successful casting of the telescope's 27.5-foot-diameter mirror blank in August 2008. 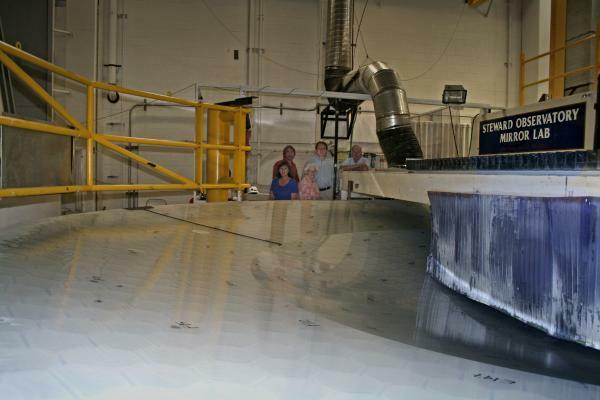 The oven lid was lifted to reveal a perfect casting, nearly 26 tons of glass melted and spun into the approximate curvature of the telescope's mirrors. LSST Director Tony Tyson, Charles Simonyi, UA Mirror Lab Director Roger Angel, The National Science Board's Steven Beering, LSST Project Manager Don Sweeney, and Purdue Physicist Ian Shipsey pose in front of the spinning oven in which the LSST primary mirror is being cast. 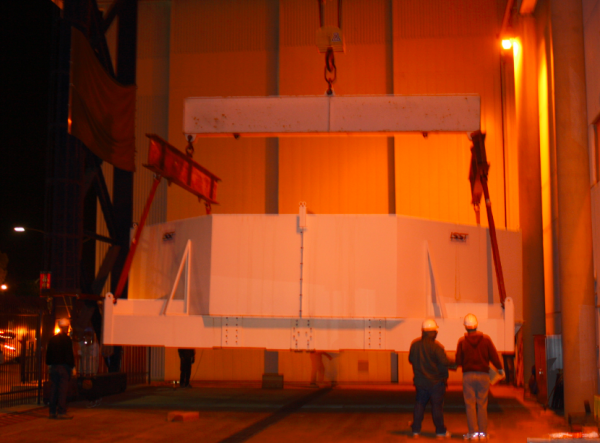 Chunks of Ohara E6 low expansion glass are loaded into the furnace mold. The loading process takes two days to complete and requires 51,900 pounds of glass.